Warner Bros. Consumer Products (WBCP), with DC Entertainment, announced today that it has once again extended its successful relationship with leading worldwide toy manufacturer, Mattel, Inc. The new multi-year agreement grants Mattel rights to continue as master toy licensee for the entire universe of DC Comics characters. Under the terms of this strategic alliance, Mattel is granted unprecedented access to the complete breadth and scope of the DC Comics vault of characters, which includes more than a thousand world-famous DC Comics Super Heroes and DC Comics Super-Villains, such as Batman, Superman, Wonder Woman, The Flash, and The Joker. The deal continues Mattel's support of the universe of DC Comics characters across its entire portfolio of core brands, including Hot Wheels®, Matchbox®, Barbie®, Mattel Games and Fisher-Price®. "Warner Bros. and DC Entertainment have an unrivaled portfolio of characters and a strong slate of content across all platforms which is essential to driving our global consumer products business—a business anchored by our long-term partnership with Mattel," said Brad Globe, President, Warner Bros. Consumer Products. "With so much opportunity on the horizon, we know Mattel will bring the talents of its world-class organization to create and market product lines for fans of all ages." In addition to the rights to utilize existing DC Comics characters and existing content, the extension includes Mattel's rights to produce toys based on future DC Comics films, animation and television projects that are developed and produced during the term of the agreement. Mattel is set to develop toy lines for two of Warner Bros.' most highly anticipated theatrical releases: the summer 2016 release of Batman v Superman: Dawn of Justice, and the recently announced Justice League film, to follow. "In our fifteen years of collaboration with Warner Bros. Consumer Products, Mattel has been honored with bringing the stories and characters of the DC Comics universe to life in toy form," said Doug Wadleigh, Senior Vice President, Global Brands Marketing, Boys and Entertainment for Mattel. "Mattel's robust portfolio has helped extend DC Comics properties to new consumers utilizing the toy brands they know and trust. We are excited to continue our partnership, and look forward to supporting upcoming entertainment launches and franchise development." During its nearly 15-year partnership with WBCP, Mattel has created and delivered a number of successful toy lines that bring the fun, action-packed heroism and excitement of DC Comics' characters to life, including top-of-the-line action figures, vehicles and role play accessories across all DC Comics brands, including tentpole films The Dark Knight Trilogy and the 2013 release of Man of Steel; to the vintage-styled line in support of the 60's BATMAN™ Classic TV Series. 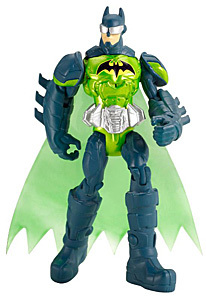 Mattel's Batman evergreen lines, Fisher-Price DC Super Friends Imaginext line, Hot Wheels® brand, as well as the multiple DC Comics Super Heroes action figure lines, together illustrate the commitment and success Mattel has had with the DC Comics brand over the years. "We look forward to continuing our strong relationship with Mattel and the Warner Bros. Consumer Products teams to collaborate on compelling product lines that support the many exciting DC Comics initiatives slated for the coming years including film, TV, games and comics," stated Diane Nelson, President of DC Entertainment. 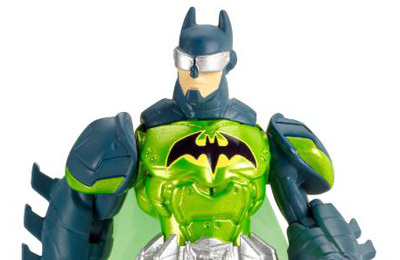 Driving its core Batman business, WBCP and Mattel continue to maintain the momentum for the ultimate Super Hero with its exclusive evergreen Batman brand that has come to life in toys and at retail. 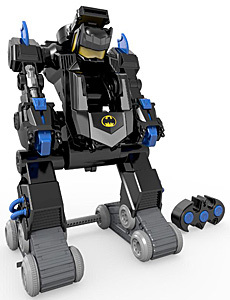 This year, Mattel has released new and exciting products in the evergreen Batman toy line, including the Lights and Sounds 10ꞌꞌ Core figures, Hot Wheels® Batmobile Assortment, Batman Basic Figures, the all-new Batman 12" Figure, as well as additional figures and characters to augment the assortment. Mattel has reinvigorated their collector offering with the new 6ꞌꞌ Total Heroes™ line for the gateway collector and the 3¾ꞌꞌ DC Multiverse line of hyper-detailed action figures for the more serious collector – both lines launched this year.